The Watson 410 Digital Humanities Studio provides a collaborative space to the KU community for instruction, research, discussion and other events that advance the practice of digital scholarship and pedagogy. Watson 410 may be used for events and activities such as seminars, workshops, hackathons, data sharing, meet-ups, and digital lab components of courses. 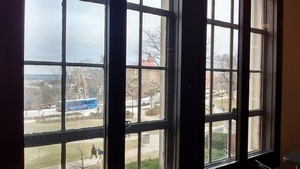 Configurable space -- Located in Watson Library -- Good views and natural light! Watson 410A is located on the 4th floor of Watson Library, next to the Graduate and Faculty lounge on the west side of the building. We welcome your ideas and suggestions. If you would like to propose a workshop, interest group, learning session, project collaboration, or other event or activity, please contact us and we will work with you to set it up or connect you with someone who can assist you. Stuck on a project and need assistance getting over a hurdle? Have an idea for a project? Need to find resources? Just curious about DH? We can help! Stop by our drop-in consulting hours every Friday. What kinds of events or activities can I use the Digital Humanities Studio for? Digital lab components of classes. Waston 410 may be booked for digital lab components of courses at KU, and for course-related training, projects or other activities. Bring people together for hackathons, edit-a-thons, technical meetups, data sharing groups, research sprints and other types collaborative work. Digital Project Development. Group sessions to work on starting a new digital project from scratch, or getting your digital projects over (technical, methodological, organiazational, conceptual, or other) hurdles. Organize workshops, mentoring meetings, seminars and training sessions. Gather for meet-ups, discussion or reading groups, ongoing or one-off interest group meetings. "How did they make that?" sessions. Do you know of a digital humanities project that you like? Schedule a session to reverse engineer it and see how it was done. We welcome your ideas and suggestions. If you would like to propose a workshop, interest group, learning session, collaboration, or other event or project, please contact us and we will work with you to set it up or connect you with someone who can assist you. 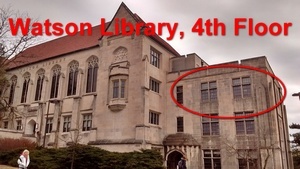 Where is the Watson 410A Digital Humanities Studio located? 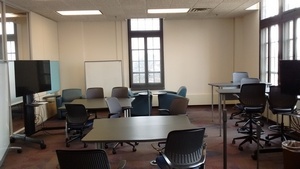 The collaboration space is located on the 4th floor of Watson Library, on the northwest side of the building, next to the graduate and faculty study lounge. Enter through the glass doors of the Graduate and Faculty Study Lounge and continue into the lounge. Watson 410 will be through the door on your right. How is Watson 410A configured? The Watson 410A Digital Humanities Studio may be configured for a variety of small or larger group activities. It features movable tables, chairs of different heights, white boards on wheels, and two large HD monitors on wheels. The space can acoomodate about 25-40 people, depending on the configuration. 12 Macbook Airs will be available soon for checkout and use within the lab space for scheduled events, collaborative activities, and classroom labs. For more information about requesting use of the laptops, please contact Pam Lerow at plerow@ku.edu. Additional software can be installed on request. Nearby is the Libraries' GIS & Data lab, scanning equipment, other computer labs and other KU Libraries' research and instruction services. How can I schedule an event in Watson 410A Digital Humanities Studio? Events and activities in Watson 410A Digital Humanities Studio are approved, scheduled and coordinated by IDRH and KU Libraries. Please check the Watson 410 calendar for ongoing and upcoming activities, and contact us to request the space or suggest an event. Can I (or my group) study in Watson 410A? When the space is not being used faculty and graduate students are free to use the space for quiet study. However, scheduled activities and activities related to teaching and collaborating, consulting on digital humanities teaching and research have priority.